As everyone who has set foot in Front Square during Freshers week knows, Trinity is a college rich in sporting history and traditions. What fewer people know is several of the university’s sports clubs are among the oldest in the country, and several are indeed the oldest. Bearing that in mind, the Society of the Knights of the Campanile is a relatively recent addition to the long and varied story of Trinity sport, and the society has had it’s ups and downs like any other. The society was formed in 1926 to mirror already existing societies in Oxford and Cambridge. The Vincent’s and the Hawks’ clubs subscribe to largely the same ethos as the Knights do: to further sport in the university and to foster sporting excellence. All of these societies are fraternal and have sororal equivalents, the Heraens being the counterpart to the Knights in Trinity. Since its foundation, membership of the Knights has been a source of pride and a badge of honour for Trinity’s most devoted sportsmen. By that, I do not mean that every Knight is an absolutely outstanding athlete, singlemindedly persuing personal acheivement or glory. Rather, a Knight should be a devoted Trinity sportsman, with a passion for the university and it’s sports clubs at heart. However, there have been lean periods in the society’s history, with years of little alumni activity and declining undergraduate membership. It is not so long ago that these were the prevaling circumstances, and it is only very recently that the society is has begun returning to what might be called full strength. On the other hand, while the society might be on it’s way back to more solid footing, the level of positive feeling towards it on campus is maybe not at an all time high. This is not always without reason, and there have certainly been misdemenours in the past which would not endear the society to the college authorities or it’s student body and do not do justice to the many excellent people who are proud to wear their Knights tie. The Knights are often labelled elitist, and it would be churlish to suggest otherwise, but I don’t think that is a necessarily a bad thing. Sport in college is an excellent thing to be involved in, and the more that can be done to encourage students to participate the better. 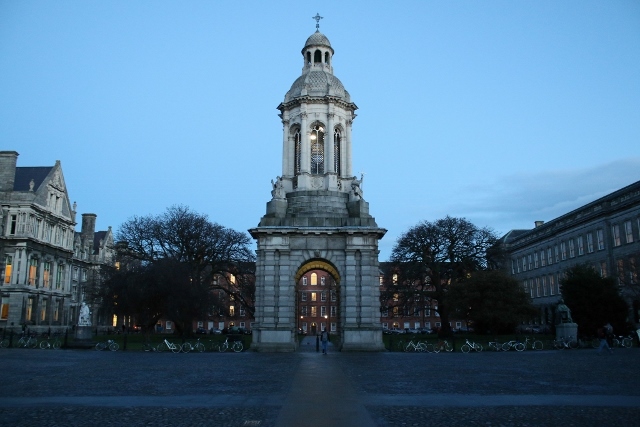 A group of individuals who are brought together without politics by virtue of their committment to Trinity sport has the potential to do a lot of good for the college community. This potential has been tapped in the recent past, when the Knights and Hereans came together to hold a charity “Try-a-Sport” day which coincided with the College races in Trinity week, raising €2000 for Goal. Then-president, Mark Raftery-Skehan, said at the time: “It is important that sport be given its proper place in College life, particularly given Trinity’s proud traditions in the field. The Knights of the Campanile and the Heraens, can play an important role in raising student participation in sport as well as in improving upon Trinity’s reputation as a sporting university.” That is a sentiment I echo. From my perspective, this gathering momentum of the Knights represents an opportunity for the it’s members to return to the core values of the society and begin to make a more concerted effort to have a positive impact in college and more actively promote sport. I hope that the increasing stability of the society’s alumni network, which is now almost 1300 strong, will offer a framework for continuity which would lead to undergrad run events like this achieving perpetuity in time. In addition, I would like to see the society looking to highlight the individual achievements of it’s members to further enhance and encourage sporting achievment and participation in college. Mark Pollock is a Knight and and excellent example for us all. His sporting achievments in rowing and endurence events are immense, and his drive and ambition in the face of both blindness and paralysis are an inspiration to all those who hear his story. I believe that events like the ‘Run in the Dark’ are an ideal opportunity for the Knights to both support a great cause and highlight the shining example that Mark is, in an effort to encourage students to follow his lead and keep challenging themselves in every way. These are opportunities we intend to get the most from in the coming years. For me, this is what being a Knight is about. College sport has been a wonderful influence on my life, and I would love to see the unique potential of the Knights exploited to encourage as many Trinity students as possible to get involved and to push themselves to achieve better things for themselves and their club. The Knights are an important part of Trinity sport and the more we can do to encourage it’s continued success, participation and struggle for excellence the better.